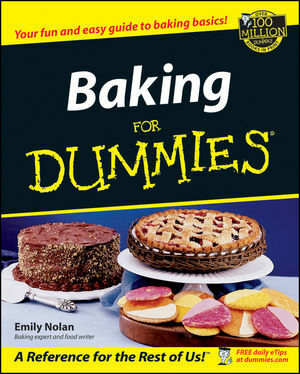 Chapter 1: Bake, For Goodness' Sake! Chapter 3: Going Over the Gear. Chapter 4: Understanding Your Oven. Chapter 6: Getting Ready to Bake. Part III: Ready, Set, Bake! Chapter 8: Creating Great Cakes. Chapter 10: Perfect Pies and Tarts. Chapter 11: Crisps, Cobblers, and Other Delights. Chapter 12: Quick Breads, Muffins, and Biscuits. Chapter 14: Savory Baked Goods. Chapter 15: Baking with Mixes and Premade Doughs. Part IV: Other Important Stuff. Chapter 17: Storing Your Creations. Chapter 18: Making the Ordinary Extraordinary. Chapter 19: Ten Troubleshooting Tips. Chapter 20: Ten Great Baking Sources. Appendix A: Glossary of Baking Terms. Appendix B: Metric Conversion Guide.